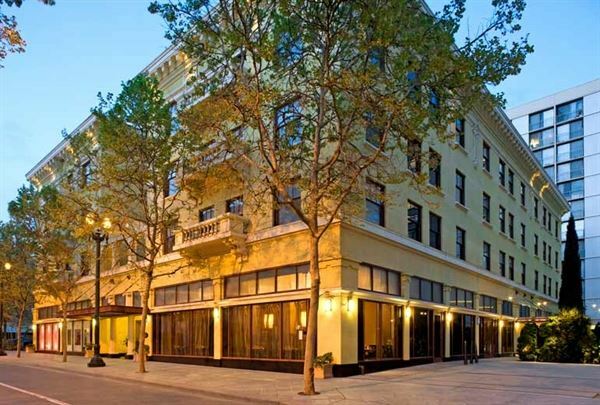 Four Points by Sheraton San Jose Downtown offers a wide assortment of San Jose/Silicon Valley area meeting and reception venues to choose from. We can accommodate a grand scale event for up to 250 people, or an intimate private wedding reception. Plus, our experts can help you plan every aspect of your special event from start to finish. Our spacious lobby, its expansive outdoor plaza with two bocce ball courts and our restaurant, Mosaic, are all options for your wedding, reception or social event. Mosaic’s private dining room, its walls draped floor-to-ceiling with shantung silk in jewel colors, is perfect for rehearsal dinner, whether its buffet style or a sit-down affair. The Plaza, located in front of the hotel, could also be used for the ceremony, a reception and dancing. Sheltered by the surrounding towers of downtown San Jose, it has three waterfall-style tiled fountains and natural rattan furniture scattered throughout a grove of small olive trees. Large open space lounge area, perfect for cocktail style receptions.